Thanks for your detailed description of heeling vs rolling – I’ve reconsidered the event and re-read all threads on NX/LO discovering comments by ‘asimut’ on the strong current in the Tromsø sound. During my trip there were many turns of similar degrees without the same “rolling”, thus I conclude that the current pushed her opposite the heeling of the turn. Thanks ever so much for keeping us informed! And thanks for the wonderful pictures!!! To me the rudder looks like the wing of an old Piper Cherokee 140 (which may be like 1,5 x 4,5 m – although I don’t have an available specimen to measure right now). What are the actual measurements of the rudder? Sooo you’re back on NX – will you be on her first trip after leaving the yard? Last edited by HARALD JARL; October 13th, 2009, 23:53. On Hurtigruten website Nordstjernen is scheduled to stay in dry dock until end of october. "Out of route until 01.11.2009"
Oh Talf, thank you so very much for these amazing photos. That first one has to be the ultimate “pakarang view” of all time!!!!!!!! I like to see all the little battle scars around the bow. The largest dents seem to be made by the anchors but I guess that's pretty normal. I wonder how she got that dink right on the nose below her star? It's way too high for a jetty. Another ship maybe? 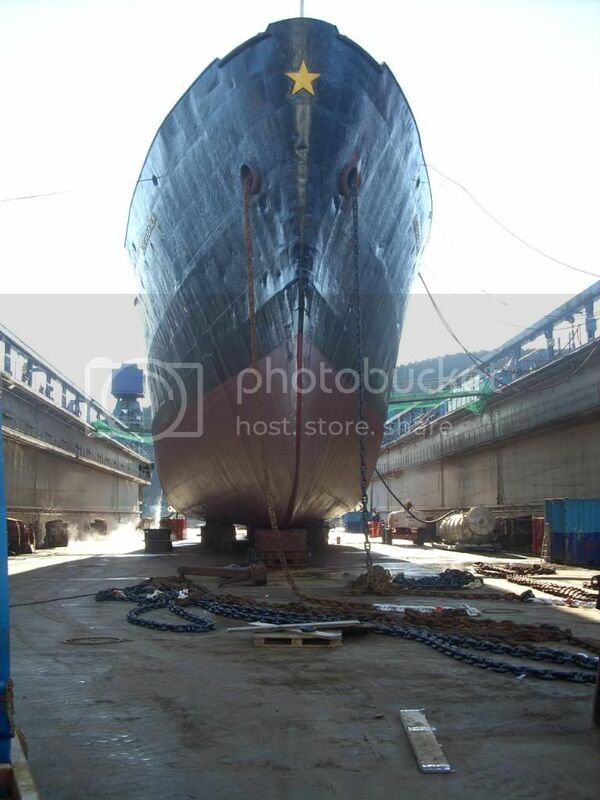 Other questions - in dry dock, how does she not fall over? And how do they see her down onto the support stacks before raising the dock - divers? I don't expect answers by the way, it's just nice to speculate. I wonder if some of the workers ever want to get a paint pen out and write "so-and-so was here " below the water line?????? 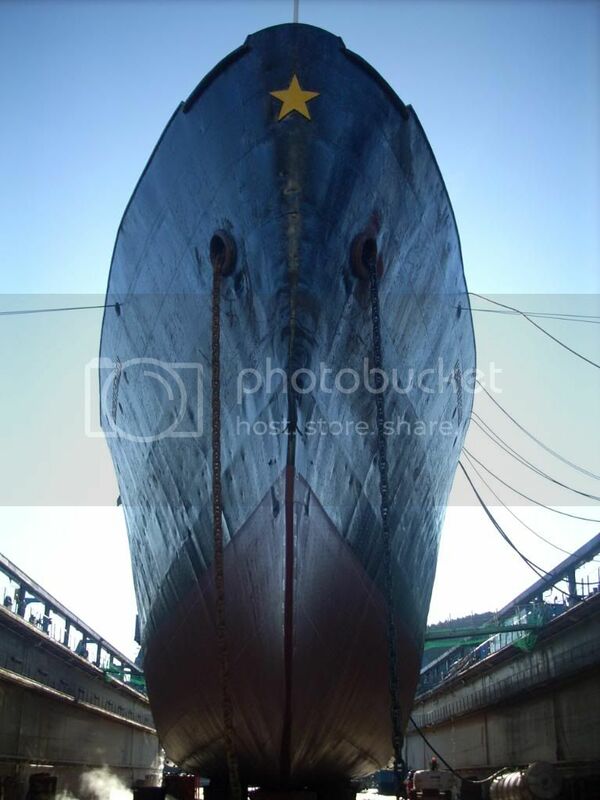 Stunning photographs and probably among the coolest images I have seen of the ship in a very long time! Not surprising at all, the engine room containing an unknown amount of asbestos. Asbestos is an instant killer by the look of the panic stricken reaction here. I'm surprised that any of us who sailed on ships in the 1960s-1980s survived at all. Asbestos plates were very popular to use in the accommodations, not only as insulation in the Engine Room. Safety rules are fine if applied with common sense, which isn't all that common by the way. If I haven't said it before, I repeat it now; It is dangerous to live!! Have you heard of anybody getting out of this alive??? Jeez h kraist, 'talf', those pictures almost gave me a heart attack!!! Re asbestos, it does no damage if left alone. Removing it requires protective gear. I do hope it coincides with hefty weather, at least strong gale or more! Thank you, it was a wonderfull moment to stand in front of the "star". Last edited by ombugge; October 24th, 2009, 10:21. All times are GMT+1. This page was generated at 03:17.